Wow! Thirty years have gone by in a flash, but at the risk of dating myself, I still remember when Flashdance rocked the film & fashion world. I was a sophomore in high school and vividly remember when leg warmers and off the shoulder work out tops became all the rage. Flashdance hit a chord and the scrappy success story resonated with many. It was a pleasure to take my own daughter, to the world premier of this stellar stage adaptation, and share this piece of my childhood with the next generation. We caught opening night and thoroughly enjoyed the energetic cast, fun costumes, choreography and set design. 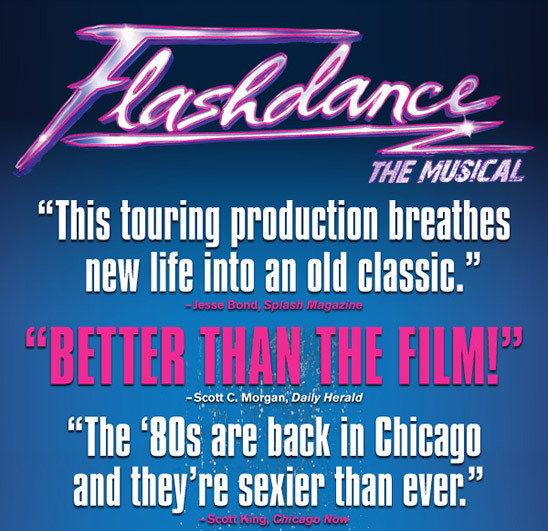 If you haven't caught Flashdance yet, go already! This limited engagement leaves Chicago after 8/18. Broadway In Chicago is thrilled to announce FLASHDANCE – THE MUSICAL, the stage adaptation of the 1983 hit film that defined a generation, opens tonight, Tuesday, August 6, 2013 at 7:30 p.m. FLASHDANCE – THE MUSICAL will play the Cadillac Palace Theatre (151 West Randolph) for a limited two week engagement through August 18. 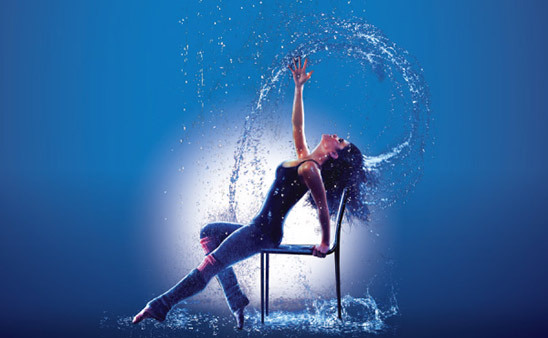 With electrifying dance at its core, FLASHDANCE‐THE MUSICAL tells the inspiring and unforgettable story of Alex Owens, a Pittsburgh steel mill welder by day and a bar dancer by night with dreams of one day becoming a professional performer. When romance with her steel mill boss threatens to complicate her ambitions, Alex learns the meaning of love and its power to fuel the pursuit of her dream. Celebrating its 30th Anniversary, the original Paramount Pictures film was a worldwide smash hit that became a pop culture phenomenon, grossing over $150 million and featuring a Grammy Award‐winning soundtrack. FLASHDANCE – THE MUSICAL features a score including the hit songs from the movie, all of which became Top Ten hits on the radio around the world including the Academy Award‐winning title song “Flashdance – What a Feeling,” “Maniac,” “Gloria,” “Manhunt,” “I Love Rock & Roll.” In addition to these hits, 16 brand new songs have been written for the stage. Joining Jillian Mueller as Alex Owens and Matthew Hydzik as Nick Hurley are Haley Hannah as Tess, Kelly Felthous as Gloria, DeQuina Moore as Kiki, Jo Ann Cunningham as Hannah, David R. Gordon as Jimmy, Matthew Henerson as Harry and Christian Whelan in the role of C.C. Also joining the company are Carleigh Bettiol, Derek Carley, Ryan Carlson, Lynorris Evans, Charlene Hoffman, Jarvis McKinley, Doreen Montavlo, Ariela Morgenstern, Shane Ohmer, Austin Owen, Kristin Piro, Katelyn Prominski, Angelo Soriano, Dani Spieler, Lawrence E. Street, and Kamille Upshaw. As previously announced, FLASHDANCE launched on January 1 at Pittsburgh’s Heinz Hall with an official opening on Thursday, January 3 and continues on to more than 25 cities with additional bookings to be announced. Directed and choreographed by Sergio Trujillo (Jersey Boys, Memphis, The Addams Family), FLASHDANCE features a book by Robert Cary and Tom Hedley (co‐writer of the original screenplay with Joe Eszterhas) with music by Robbie Roth and lyrics by Robert Cary and Robbie Roth. The production features scenic design by Klara Zieglerova, costume design by Paul Tazewell, lighting design by Howell Binkley, with projection design by Peter Nigrini and sound design by John Shivers and David Patridge. Hair & wig designs are by Charles LaPointe and make‐up design by Cookie Jordan. The production also features music supervision and vocal and incidental arrangements by Jason Howland, orchestrations by Doug Besterman and dance arrangements by Jim Abbott. The performance schedule for FLASHDANCE – THE MUSICAL is as follows: Tuesdays at 7:30 p.m. Wednesdays at 7:30 p.m. (additional matinee performance on 8/14 at 2 p.m.) Thursdays at 7:30 p.m.
Fridays at 7:30 p.m. Saturdays at 2 & 8 p.m. Sundays at 2 p.m. (additional performance on 8/11 at 7:30 p.m.) Please note: Ticket prices and performance schedule are subject to change. TICKET INFORMATION Tickets for FLASHDANCE – THE MUSICAL at the Cadillac Palace Theatre range from $18‐$85. A select number of premium seats are also available for many performances. Tickets are available now for groups of 10 or more by calling Broadway In Chicago Group Sales at (312) 977‐1710. Tickets are available at all Broadway In Chicago Box Offices (24 W. Randolph St., 151 W. Randolph St., 18 W. Monroe St. and 175 E. Chestnut), the Broadway In Chicago Ticket Kiosk at Water Tower Place (845 N. Michigan Ave.), the Broadway In Chicago Ticket Line at (800) 775‐2000, all Ticketmaster retail locations and online at www.BroadwayInChicago.com. For more information, please visit www.broadwayinchicago.com or www.flashdancethemusical.com. MATTHEW HYDZIK (Nick Hurley), a Pittsburgh native, is beyond thrilled to be a part of the world premiere of Flashdance the Musical. Matthew was last seen on Broadway as Tony in West Side Story and Kenickie in Grease, as well as national tours of Rent, Fame and Grease. All my love to my Meg! KELLY FELTHOUS (Gloria). National Tours/Off-Broadway: Grease (Marty), Seussical (Mayzie), Max and Ruby (Ruby) New York/Regional: Legally Blonde (Elle), Bring It On (Eva), A Chorus Line (Val), Boeing Boeing (Gloria), Singing in the Rain (Kathy), Gypsy (June), Urinetown (Little Sally), Dames at Sea (Ruby). International: Fame (Serena), Trip of Love (Caroline). NYU/ CAP21. Thanks Mom, Charns, Henderson Hogan and the Flashdance family! DEQUINA MOORE (Kiki). Broadway: Legally Blonde (Pilar), Little Shop of Horrors (Chiffon), Two Gentlemen of Verona (u/s Sylvia), Happy Days (Lola), Hair (AFC). Film: “Joyful Noise” (Devonne), “Madea’s Big Happy Family,” “Ghost Town,” “Rachel Getting Married,” “Camp.” TV: “Law & Order: SVU,” “Racing For Time,” “Third Watch” (recurring), “All Falls Down.” B.F.A. NYU/CAP21. ...Thanks be to God! Love to Mom, Dad, Eron, family & friends. HALEY HANNAH (Tess) is thrilled to join the National Tour of Flashdance! Broadway: Bring It On The Musical. Tours: Bring It On The Musical. Regional: Cutman - A Boxing Musical (Goodspeed). TV: “Good Morning America” (Back up singer for Demi Lovato, Jonas Brothers), “American Comedy Awards” (Comedy Central). BFA: University of Michigan. Much love to Mom, Dad, and friends. JO ANN CUNNINGHAM (Hannah). Broadway: The King and I, Anna Karenina. Off-Broadway: The Show Goes On, Night Seasons, Ladies of the Corridor, Edward the King, Swan Song. Tours: Into the Woods, Meet Me in St. Louis, Carousel, A Little Night Music. Regional: Full Gallop, The Dining Room, Follies, Chemin De Fer, Hello Dolly, Kismet, How the Other Half Loves and lots more. DAVID R. GORDON (Jimmy) is beyond excited to be part of his 1st National Tour! Favorite roles include: Roger (International Tour of Grease), Abraham (Altar Boyz) and Bobby Strong (Urinetown). Special thanks to The Roster, Sergio, the creative team, Tara Rubin Casting, and the entire cast. This one’s for my support team. Ali, Momma, my big ol’ family and friends . . . we did it!!!!!! www. DavidRossGordon.com. DEREK CARLEY (Ensemble; Swing; u/s Nick; u/s Jimmy; u/s C.C. ; u/s Joe; u/s Andy) is so happy to be a part of this production! Regional credits include Titanic (Charles Clarke) at the MUNY and Gay Bride of Frankenstein (Thad) at Seacoast Rep. Proud graduate of the University of Michigan’s Musical Theatre Program; Go Blue! Huge thanks to everyone at Harden-Curtis and Tara Rubin Casting. For Jenna. LYNORRIS EVANS (Ensemble; u/s Joe; u/s Andy), A graduate of Fordham University, he was last seen on the 1st National Tour of Memphis, the Musical. Other credits include Leap of Faith on Broadway, Cirque du Soleil’s Viva Elvis, Santa Fe Opera and BalletMet. CHARLENE HOFFMAN (Ensemble; u/s Ballet Dancer) has performed in numerous stage shows including the 50th Anniversary International Tour of West Side Story (Marguerita). Along with appearances on “Glee” (Cheerio), she has recently shared the stage with Kanye West, Chris Brown and P!nk. When she isn’t cutting a rug you can find this self-proclaimed tomboy cheering on her favorite NFL teams or cruising in her 1970 Ford Mustang. JARVIS McKINLEY (Ensemble; u/s Ballet Dancer). Tours: Usher, KiCi & JoJo, Ailey II, Complexions Contemporary Ballet, and Armitage Gone Dance!. He was also rewarded the Margret Foretyn Award Also recently seen on the First National Tour of Memphis the Musical. Thank God and my family and friends who supported me on my way to my biggest dream. KRISTIN PIRO (Swing; u/s Alex; u/s Kiki; u/s Louise; u/s Miss Wilde; u/s Ballet Dancer; Dance Captain) is thrilled to be joining Flashdance! Broadway: Catch Me If You Can. Tour/Reginal credits: Memphis, Saturday Night Fever, The Jack Cole Project, West Side Story, Chicago, How to Succeed. Infinite thanks to Sergio and CGF. Endless love to my parents, Lauren and fiancé Ryan! ANGELO SORIANO (Ensemble; u/s Joe; u/s Andy; u/s Break Dancer) is a native of the Philippine Islands. Recent credits include The Red Car News Boys (Disneyland AGVA), A Totally Tomorrowland Christmas (Walt Disney World AEA), Disney Junior: Live on Stage (Casey). Performed with Justin Bieber, Debby Ryan, Disney's Shake It Up, Macy Gray, MC Lyte. HUGE thanks to my "Pamilya", music mentors, dance teachers, Flashdance creatives and DDO NY. LAWRENCE E. STREET (Joe; Ensemble; u/s Harry; u/s C.C.). Broadway: Urinetown (Billy Boy Bill). Off-Broadway: Archbishop Supreme Tartuffe (Cleante); Urinetown (Billy Boy Bill). Actors’ Fund of America: Chess in Concert (Ensemble). Carnegie Hall, NYC: South Pacific in Concert (Starring Reba McEntire); also filmed for PBS Great Performances. Member of Actor’s Equity Association. Special thanks to Avalon Artists and Tara Rubin Casting. KAMILLE UPSHAW (Ensemble) Born in Washington, DC, Kamille is a graduate of The Juilliard school. She has worked with Darrell Grand Moultrie, the Metropolitan Opera, Rasta Thomas’ Bad Boys of Dance 2011-2012 European Tour, danced for Alicia Keys and now is very excited to join Flashdance! Love to my family! SERGIO TRUJILLO (Director & Choreographer). Broadway: Tony Award® winning Best Musical Memphis (OCC Award, Astaire, Drama Desk Award noms. ), Tony and Olivier Award® winning Best Musical Jersey Boys (Olivier, Drama Desk, Dora, OCC Award noms. ), Leap of Faith (Drama Desk, Astaire noms), The Addams Family, Next to Normal (Lucille Lortel Award nom), All Shook Up, Guys and Dolls (Astaire Award nom.). Off-Broadway: Saved (Lucille Lortel nom. ), The Capeman, Romeo & Juliet (Public), A Tree Grows in Brooklyn, Kismet (Encores!). Regional: White Noise (director/choreographer), The Wiz, Zhivago (La Jolla), Mambo Kings. International: Disney’s Tarzan (World Theatre Award nom. ); West Side Story; The Sound of Music (Stratford); Peggy Sue Got Married (West End). TV: Judging/ choreographing on “So You Think You Can Dance: Canada,” “Broadway: The American Musical” (PBS), “The 14th American Comedy Awards” (ABC), “Triple Sensation” (CBC). Ovation Award for “Empire.” Four Dora Award nominations in Canada. In 2012, Mr. Trujillo was chosen by the Colombian government as one of the top 100 Colombians in the world. TOM HEDLEY (Book; Executive Producer). Having written the original screenplay, Hedley first coined the title Flashdance. Additionally, Hedley penned screenplays for Michael Jackson, Barbra Streisand, Sean Penn, Jean- Paul Goude, Federico Fellini, David Geffen, Dino de Laurentis, among others. Winner of the Humanitas Prize for the Academy Award winning movie “Iris,” starring Judy Dench, Kate Winslet and James Broadbent. Previously, he was the youngest editor of Esquire Magazine during its golden age and the editor/publisher of Duckworth, a distinguished London publishing house. Hedley is presently writing a new film that he will direct next year. ROBERT CARY (Book & Lyrics) is lyricist and co-author of Palm Beach (La Jolla Playhouse, directed by Des McAnuff); co-author with Ben Feldman of Inventing Avi (Off-Broadway, directed by Mark Waldrop); and director of the feature films “Ira and Abby,” “Save Me,” and “Anything But Love,” which he co-wrote. Cary has written a new ZZ Top musical premiering soon. ROBBIE ROTH (Music & Lyrics). Robbie Roth’s music has been heard on stage, screen and radio around the world. His songs have appeared on the Billboard charts in America and he has written and produced for countless artists including Tony-nominated Gavin Creel. Robbie is currently working on the stage adaptation of the 2002 Fox feature, “Drumline”, while enjoying time spent with Michelle, Oliver and Simon.